I’ve been back home working as a professional for close to two years now, and I’m continually amazed by all the cool people doing interesting things around this city. Earlier today, on one of my usual adventures looking for people enjoying (or sometimes not) the weather around town for the Herald, I ran into this group doing some yoga along the Esplanade. They seemed so focused, but everything about the scene just worked together from the poses to the light to the weather. Here are a few photos from my walk along the river. 5.30.2010 — BOSTON — Jen Hui Bon Hoa, right, and Sara Bercholz, of Boston, and Michael D. Andelman of Cambridge practice their yoga along the Esplanade on May 30, 2010. 5.30.2010 — BOSTON — Jen Hui Bon Hoa, left, and Sara Bercholz, of Boston, and Michael D. Andelman of Cambridge practice their yoga along the Esplanade on May 30, 2010. Heard a call on the scanner last night about a really smokey fire at a restaurant in Charlestown. It was a one-alarm fire when I took off, relatively minor, but the smoke was what made me get in the car. I was right about it being minor — it was pretty much out by the time I got there about 10-15 minutes after the call, though it had been upgraded to a two-alarm very briefly. Turned out it was a really bad grease fire in one of the kitchen vents on the side of the building. Unfortunately for the restaurant, the process of putting out the fire in the vents resulted in the kitchen getting flooded out. A big mess for a really inconveniently located grease fire. 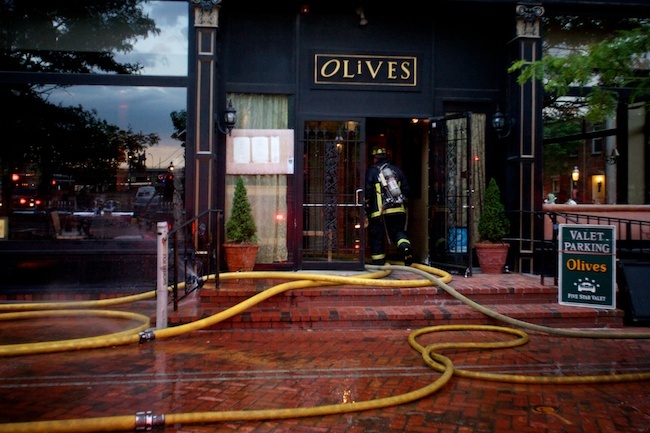 5.27.2010 — BOSTON — Firefighters hose down a kitchen vent that caught fire at Olives restaurant, 10 City Square in Charlestown, on May 27, 2010. 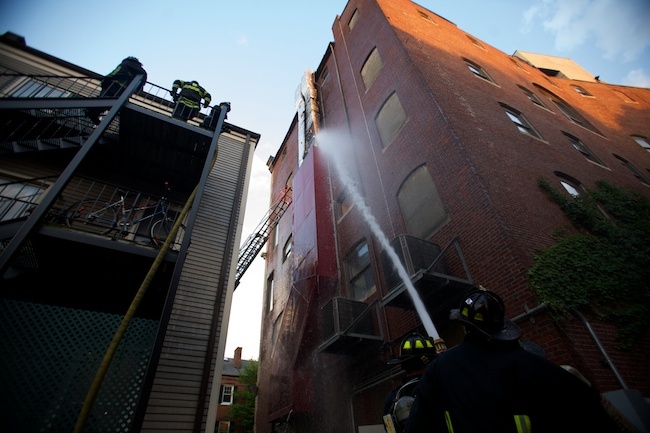 The two-alarm fire caused heavy smoke and was likely caused by a grease backup in the air vent, Boston Fire spokesman Steve MacDonald said. 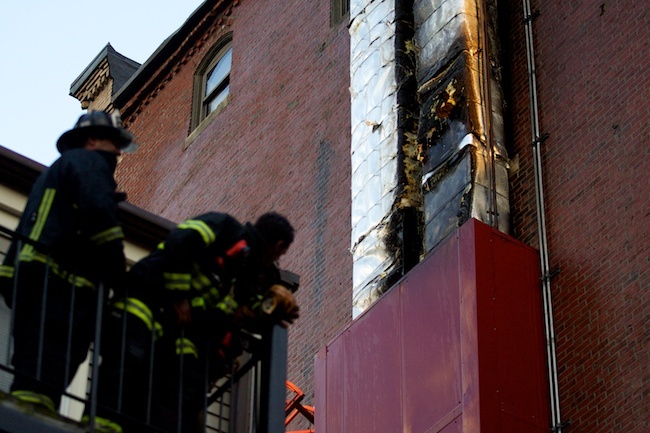 5.27.2010 — BOSTON — Firefighters on a neighboring balcony take a closer look at a kitchen vent that caught fire at Olives restaurant, 10 City Square in Charlestown, on May 27, 2010. 5.27.2010 — BOSTON — A firefighter enters Olives restaurant, 10 City Square in Charlestown, to check on the status of a fire on May 27, 2010. 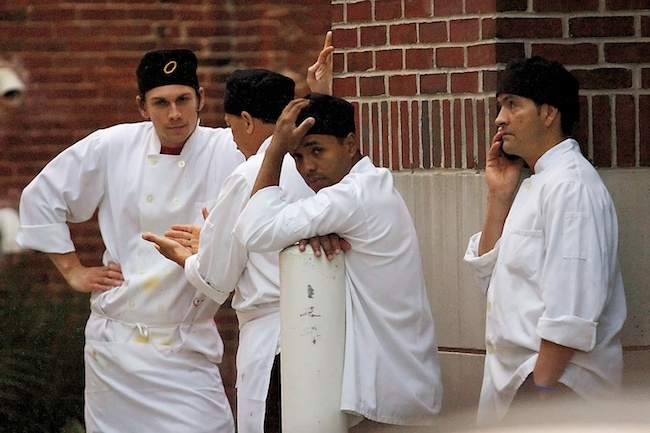 5.27.2010 — BOSTON — Cooks from Olives restaurant, 10 City Square in Charlestown, wait outside after their restaurant was evacuated due to a fire on May 27, 2010. An outtake from a high school volleyball assignment I shot today. 5.27.2010 — NEWTON, Mass. — Needham at Newton South. MIAA Boys Volleyball South Sectional Semi-Finals. For the record, I have never claimed to be good at photographing volleyball!